Ever since I started using Couscous for Breakfast as Puttu, serving the kids in the mornings became such a breeze. But this is the first time, I’m using Couscous in a salad. With the summer building up to its peak, eating a full fledged meal is proving to be more difficult and having a wholesome diet with all the nutrients in a salad has become more than welcome. Indian summer salads use lots of fresh vegetables and fruits and are also very easy to make as well and more over they require very little or no cooking at all which is a big welcome in this sweltering heat. From this month on “The Groovy Gourmets” is open to all who wish to join us and for this month we decided to go Gourmet with Vegan recipes from Roxana’s space and I chose this simple yet scrumptious salad as this itself makes a wholesome meal in itself. This salad brings out the different tastes and you just can’t help appreciating the different textures of all the ingredients of the salad. You may also be interested to check out these Savory Couscous Muffins which makes for a healthy snack. Heat a pan with 1/4 cup of water and add 2 pinch salt to it. When it comes to a boil, add the couscous, shake the pan and close with a lid and let it be for 10 minutes. Peel, remove the seeds and chop the cucumber finely. Cut the tomato into two, scoop the seeds out and chop them finely as well. Chop the onion (if using) and mango finely. Deseed the melon and chop finely. Use only the leaves of the coriander / parsley and chop them fine as well. In a small bowl, prepare the dressing by whisking together lemon juice and oil till they emulsify well. Season with salt and pepper according to your taste. In a big bowl place the chopped vegetables, watermelon and add the dressing and toss well to coat. Fluff the couscous with a fork and it to the salad bowl and toss well to coat and mix together. Place the bowl in the refrigerator and serve chilled. Feel free to add roasted nuts like peanuts or almonds. You can add carrots, zucchini cooked peas along with the other vegetables. You can also add seedless black grapes and pomegranate pearls along with watermelon. This is off to “The Groovy Gourmets”. Want to join us in the fun ride from next month on, just send me an email to ticklingpalates@gmail.com and meanwhile do not forget to check out all the other goodies rustled up by the other Groovy Gourmets. Super comfort and healthy salad for summer. What a healthy bowl of salad…love the colors too. Prefect salad for hot weather,beautifully done. 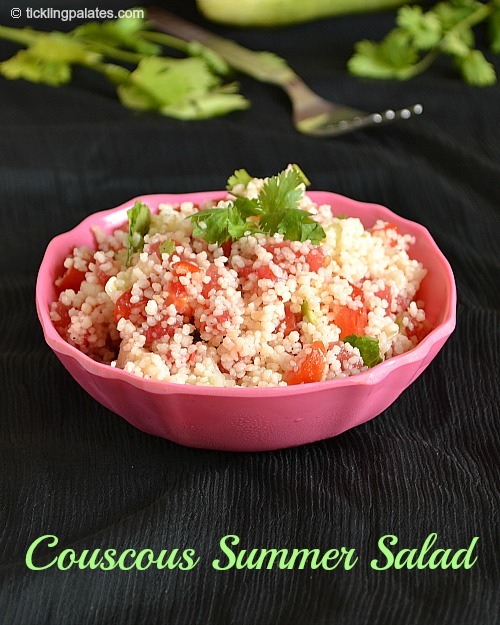 I make lot of couscous salad too… If you find pearl couscous try them.. My kids especially love the bigger bolder texture. Lovely colourful salad…Where did you get couscous…is it known by this name only in the shops? Looks so good.I didnt know the indian name for couscous thanks for sharing.